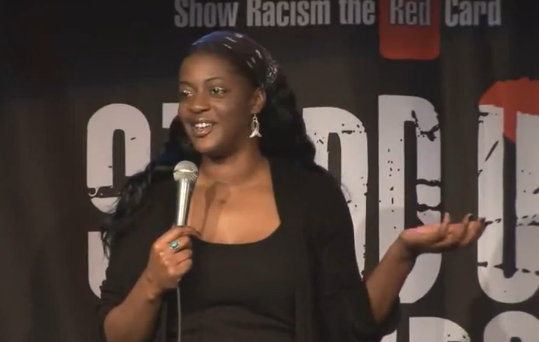 Ava Vidal is a comedian and patron of Show Racism the Red Card campaign. She regularly attends our educational events to answer young people's questions and has performed at some of the Stand Up Against Racism shows. Racist abuse on social media platforms such as Twitter has been in the news and on the increase over the last year. Ava is a Twitter user and has unfortunately, received abuse from other users. We asked her about her experience and what can be done to stop racist abuse on social media platforms. How do you feel when you read abusive messages directed at you? Is there a particular experience you would be willing to share? Why do you think people send racist and abusive messages on social media? "I imagine it's for all kinds of reasons. Because the screen acts as what they would call in drama or comedy, 'the 4th wall.' There is a barrier between you and the person you're speaking to therefore people say thing they wouldn't necessarily say if they were face to face with that person. There is no risk that what you're saying will cause a physical fight. Sometimes people use pseudonyms online so they feel very safe to post abuse." How would you respond if someone said, “If you don’t like the abuse, why don’t you just stop tweeting”? "It annoys me when people say this because what they are actually doing is blaming the victim. Why don't they expect the people doing the abusing to leave Twitter?! I also get annoyed when people claim they are trying to help and give you unsolicited advice about what to tweet about. Often they tell you if you ignore the racism then it will stop. This is despite evidence to the contrary. Many people that don't tweet about the subjects are sent abuse too." You did leave Twitter for a while – what made you decide to return to it? "Twitter helps me stay in contact with people that like my work. When I did a recent run at a West End theatre a good percentage of the audience were people that had followed me on Twitter. I also use Twitter as a way of following current affairs. A lot of the people I followed would post articles of interest that I could read and share. I don't see why I should have to miss out on that because of some small minded racists and misogynists. Anyway it didn't stop it and they only emailed it to me. At least on Twitter it's limited to 140 characters!" Do you think racist attitudes have increased because of social media, or that there is just a new outlet for people with those attitudes? "I think that it is just a new outlet. It is depressing when you see these racist comments online but I believe it shines a light on the society that we live in. Often as a victim of racism you're told that you're imagining it, or excused of exaggerating. Well a quick search on Twitter or youtube will prove that you're not!" Do you think Twitter could/should do more to stop this sort of abuse? "Twitter could have a department that responds quickly to reports of racial abuse. They could give advice on what to do if it happens to you. They could have forms that are sent directly to the police. They should let users know that they have a zero tolerance policy towards racial abuse." What advice would you give to someone who received hateful messages online? "Go to the police. If these people are named and shamed and then jailed like Liam Stacey was, then I believe that they would think twice."